In order to bring clarification to the Black Narrative, we surveyed the student body of N.C. A&T. 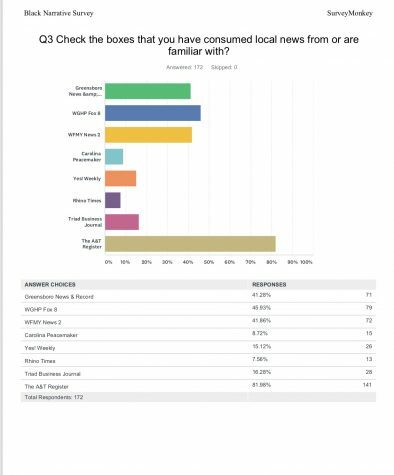 The purpose of this survey was to examine how students perceive the coverage done by local media outlets. Hypothesis #1: If local media outlets of Greensboro, NC use N.C. A&T as a locator for crime on the eastern side of Greensboro then N.C. A&T students will recognize the trend. Hypothesis #2: If the majority of the coverage of N.C. A&T is centered around athletics and homecoming students will recognize the trend. 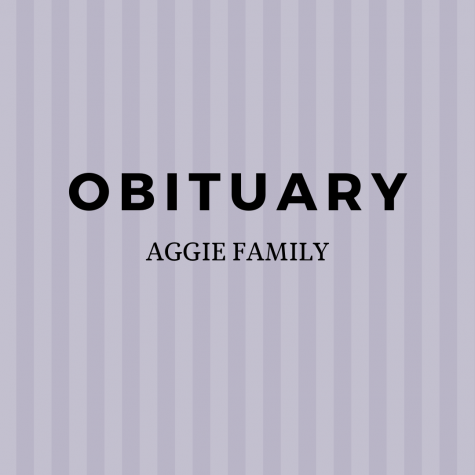 The A&T Register surveyed 172 students from February 18, 2019 – April 4, 2019, utilizing Survey Monkey for 14 questions. 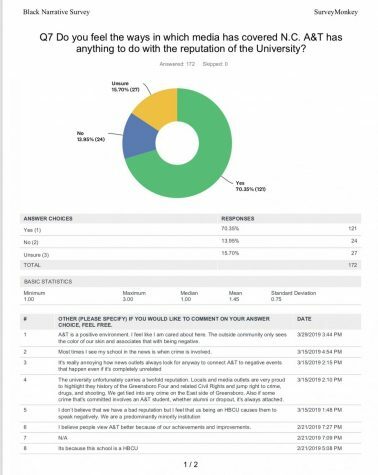 We aimed to survey more than 300 students but due to a lack of cooperation and circulation of our survey methods, we weren’t able to secure our desired number. Therefore we know our survey needs further development in measurements of qualitative research in the form of single interviews instead of quantitative like a standard survey. The first question we asked students pertained to their Q1. consumption of news from local media outlets in Greensboro, NC and 54 percent of students confirmed their consumption of local news, and 45 percent of surveyors chose no. 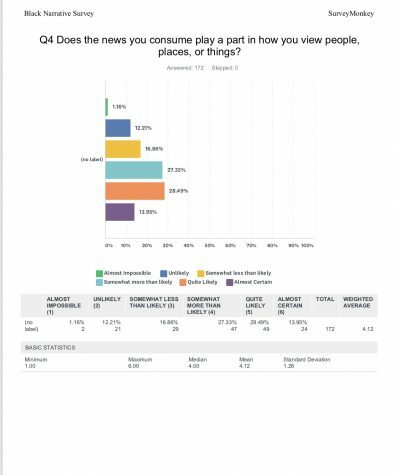 The importance of knowing if more than half of the student body consumes local news amplifies our survey, as well as the rest of the responses and their relevance to the Black Narrative. Without knowing if the students consume news we can’t determine if they see a problem in the coverage of N.C. A&T. We asked students if they had Q2. any news application their phones and 67 percent answered yes, while 32 percent surveyed no. Q3. asked for the student body to check all local news outlets that they consumed news from. 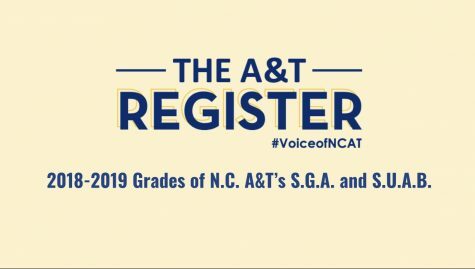 The A&T Register stood as an outlier with 81 percent of student consumption; which is typical seeing that the targeted audience was N.C. A&T students and the A&T Register is the on-campus student newspaper for N.C. A&T. 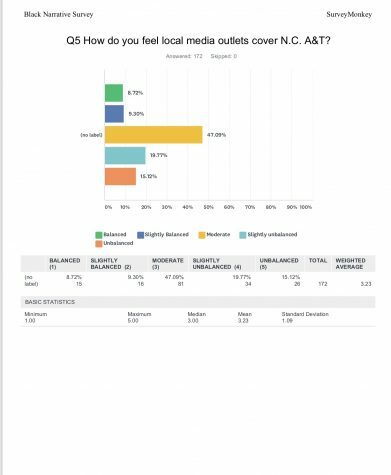 Besides the A&T Register, WGHP Fox 8 followed with 45 percent then the News & Record and WFMY News 2 both shared 41 percent of students familiarity of local news outlets. 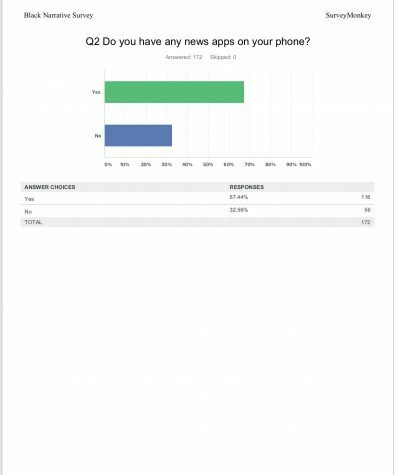 To verify that news has the ability to alter perception we asked the students Q4. how did they feel the news they consume plays a part in how they view people, places, or things? Majority of students (49 students) surveyed that news consumption is quite likely to play a part in how we view the world. We also asked students Q5. 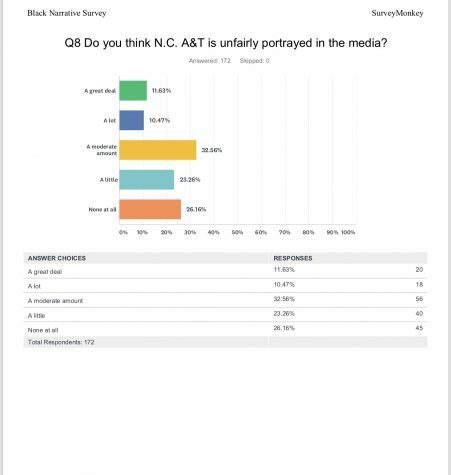 how they feel local media outlets cover N.C. A&T, 47 percent of students selected that local media outlets cover N.C. A&T moderately following with 19 percent of students feeling that coverage is slightly unbalanced. Q6. 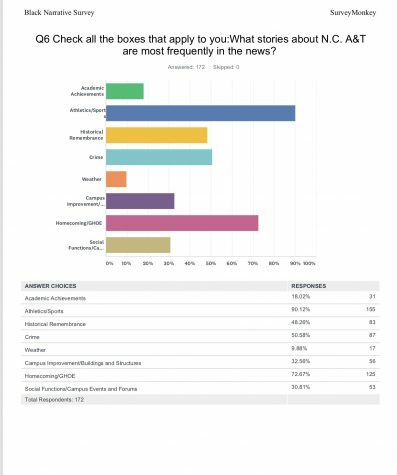 asked students to check the boxes they felt were most frequently in the news about N.C. A&T and 90 percent of students chose the category athletic/sports stories while 72 percent chose homecoming/GHOE coverage. To seek a generalized assumption from the students about N.C. A&T Q7. we asked how they felt media has covered N.C. A&T and if that coverage had anything to do with the reputation of N.C. A&T and 70 percent of students answered yes. 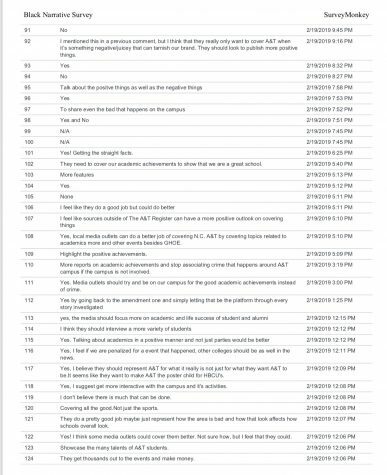 We also added a response option for students to voice their opinions of the reputation they were speaking of. Surveyor #2: Most times I see my school in the news is when a crime is involved. 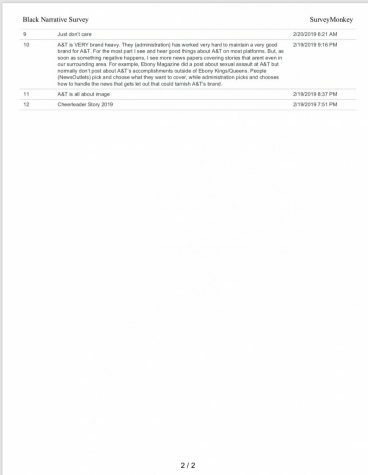 Surveyor #5: I don’t believe that we have a bad reputation but I feel that us being an HBCU causes them to speak negatively. We are a predominantly minority institution. Surveyor #10: A&T is VERY brand heavy. They (administration) has worked very hard to maintain a very good brand for A&T. For the most part, I see and hear good things about A&T on most platforms. But, as soon as something negative happens, I see more newspapers covering stories that aren’t even in our surrounding area. For example, Ebony Magazine did a post about sexual assault at A&T but normally don’t post about A&T’s accomplishments outside of Ebony Kings/Queens. People (news outlets) pick and choose what they want to cover, while administration picks and chooses how to handle the news that gets let out that could tarnish A&T’s brand. Students were also asked Q8. 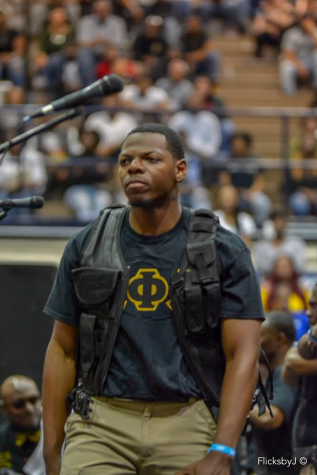 if they think N.C. A&T is unfairly portrayed in the media? 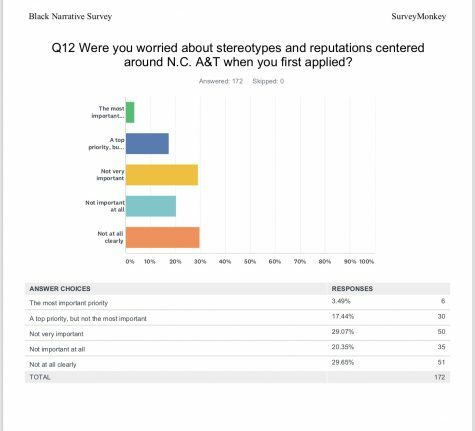 32 percent of surveyors chose that N.C. A&T is unfairly portrayed in the media a moderate amount, while 26 percent chose not at all. Q9. 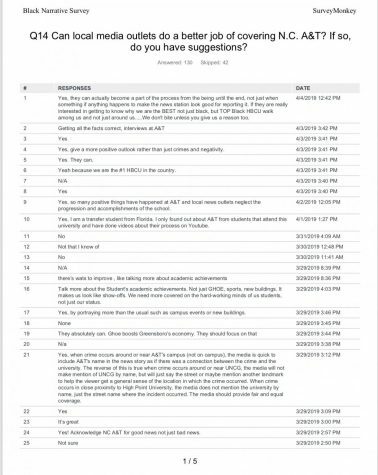 asked students if they have ever received negative feedback after telling someone that they attend N.C. A&T? Students votes were split almost evenly with 55 percent of students responses being no and 44 percent yes. We asked students Q10. 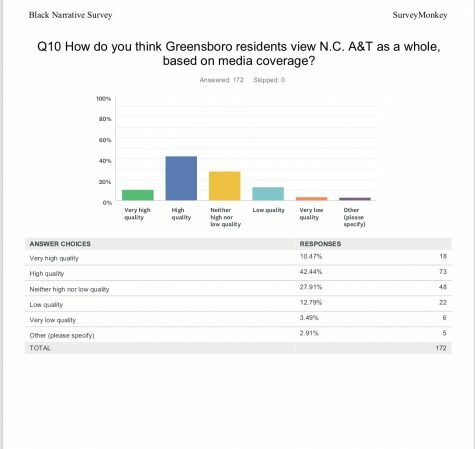 how they thought Greensboro residents view N.C. A&T based on media coverage? 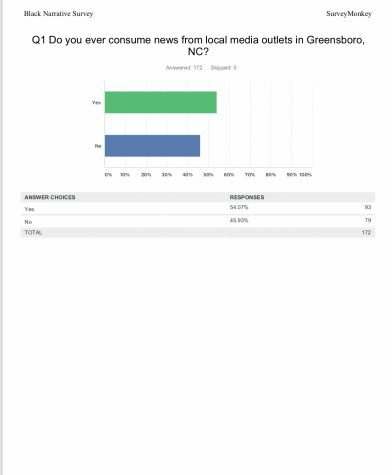 Majority of students (73 students) surveyed that Greensboro residents thought of N.C. A&T as high quality while other students (48 students) felt the residents look at N.C. A&T as neither high nor low quality. When students were asked Q11. how they felt the location of N.C. A&T affects how it is covered in the media 45 percent of students chose not so desirable while 34 percent chose somewhat desirable. 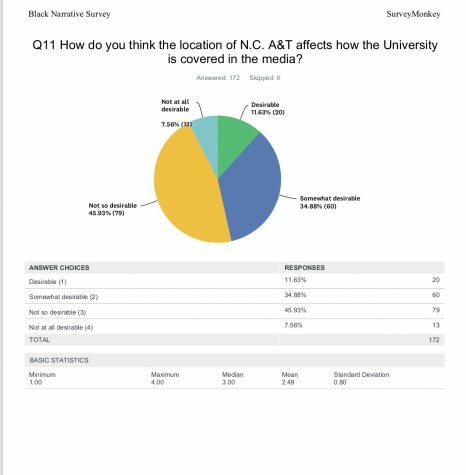 This survey question is pertinent because of how often N.C. A&T is used as a locator for the eastern side of Greensboro. Students were also asked Q12. 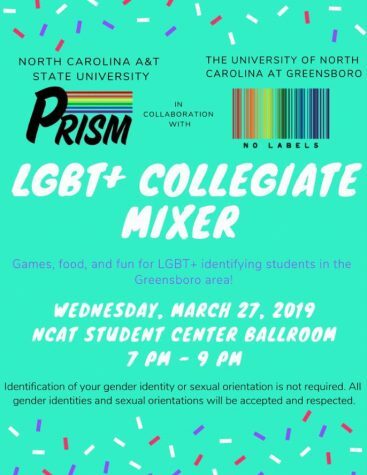 if they were worried about stereotypes and reputations centered around N.C. A&T when they first applied? 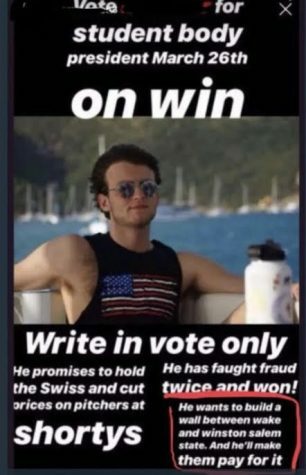 It was an even 29 percentage between students who chose not at all clearly and students who chose not very important. Q13. asked students how satisfied they were with the local media coverage of homecoming/GHOE? 42 percent of students surveyed that they were satisfied with the coverage. 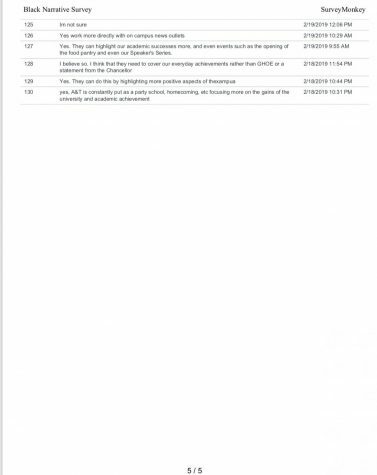 The last question of the survey was intended to be open-end where students could express Q14. if they felt local media outlets could do a better job of covering N.C. A&T and to provide suggestions. Out of 172 surveyed students only 130 participated in the open-end portion. Surveyor #1: Yes, they can actually become a part of the process from the being until the end, not just when something if anything happens to make the news station look good for reporting it. 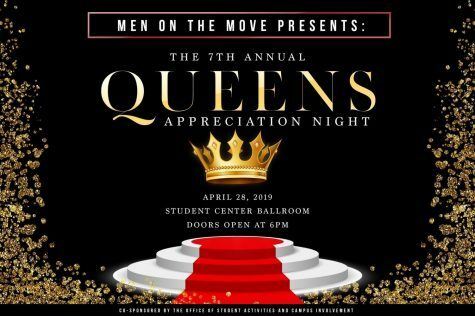 If they are really interested in getting to know why we are the BEST not just black, but TOP Black HBCU walk among us and not just around us…..We don’t bite unless you give us a reason too. Surveyor #16: Talk more about the Student’s academic achievements. Not just GHOE, sports, new buildings. It makes us look like show-offs. We need more covered on the hard-working minds of us students, not just our status. Surveyor #43: Yes definitely. 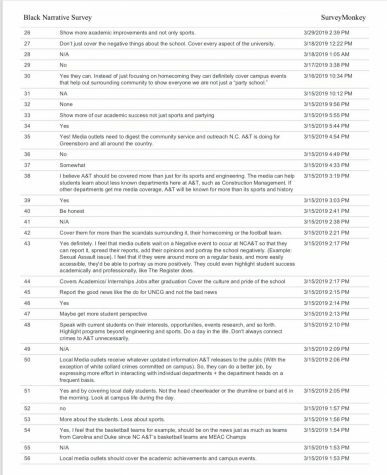 I feel that media outlets wait on a Negative event to occur at NCA&T so that they can report it, spread their reports, add their opinions and portray the school negatively. (Example: Sexual Assault issue). I feel that if they were around more on a regular basis, and more easily accessible, they’d be able to portray us more positively. They could even highlight student success academically and professionally, like The Register does. 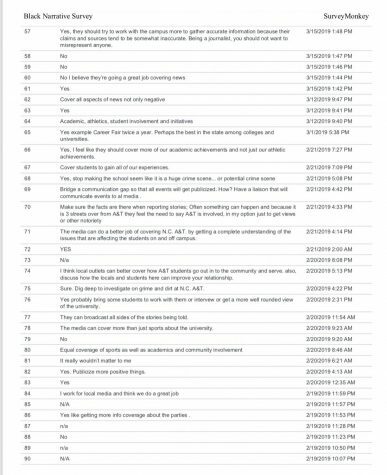 Surveyor #110: More reports on academic achievements and stop associating crime that happens around A&T campus if the campus is not involved.